Cooperation on summit events between European security authorities has been running like clockwork for more than 20 years. Police and intelligence services have exchanged information on threats and “individuals who pose a terrorist threat”, have assisted each another with personnel and equipment and seconded liaison officers. Shortly before such summits, the Schengen Agreement is partially suspended and border controls reintroduced while travel bans are imposed on undesirable protesters. If there are clashes with the police during protests, politicians never fail to call for the establishment of a European database on left-wing activism – but to no avail to date, however. Back in July 2001, one week prior to the G8 Summit in Genoa, the EU home affairs ministers agreed to pursue “violent troublemakers” across Europe. Three months later, they declared their intention to gather data on persons who were“notoriously known by the police”. It was against the backdrop of mass incidents at the G8 in Heiligendamm in 2007 of police officers running away from water cannon and into their own pepper spray, which had the effect of increasing the number of those injured, that then Minister of the Interior Wolfgang Schäuble (CDU) put the pursuit of “violent trouble makers” back on the agenda of the Justice and Home Affairs Council. Later, the group of individuals to be pursued was variously dubbed “violent travelling offenders” and “euro anarchists” (see the whole history at Statewatch). 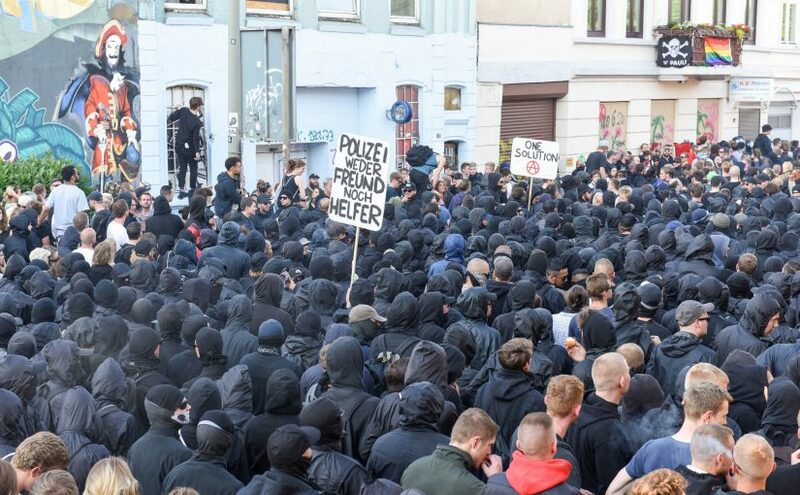 After days of clashes around the G20 Summit in Hamburg, the talk now is of setting up a European database on left-wing “extremists” or those “who pose a terrorist threat”. The German Federal Minister of Justice Heiko Maas (SPD) is in agreement with a number of members of the governing coalition and is calling for the establishment of a pan-European database in order to tackle “brutal riot tourists” on borders. It was Federal Minister of the Interior Thomas de Maizière (CDU) who drew the problematic nature of such a database to his colleagues’ attention as joint criteria for storing data relating to a specific group of individuals must first be defined across Europe. All previous attempts to this end at European Union level had failed as a consequence of this hurdle. Data pertaining to “opponents of globalisation” has already been stored separately for a number of years now. The database managed by the Federal Criminal Police Office (BKA) previously went by the name “violent troublemakers who are active internationally” (“International agierende gewaltbereite Störer” or IgaSt). This database stored information on political activists against whom investigations had been launched in the context of previous “events relating to globalisation”. The database also included persons who “have become known as globalisation opponents domestically” and for whom the Federal Criminal Police Office has “evidence of violent acts committed in the past”. Convictions were not a precondition for storage in the database. Simple surveillance in the proximity of demonstrations was a sufficient criterion. IgaSt has now been merged with the database “politically motivated crime” (“Politisch motivierte Kriminalität links – Zentralstelle”, or PMK-links Z), which is also managed by the Federal Criminal Police Office. It remains the case that only data pertaining to German nationals is stored. Storage of this data results in a great deal of hassle for both contact persons and those under investigation. For example, the Federal Police used storage of data in 2009 as an opportunity to impose travel bans for the NATO summit in Strasbourg. Entire groups were under investigation in a number of cases, even if only one of these individuals was recorded in the IgaSt database. In almost all cases, the administrative court in Kehl overturned the travel bans through expedited proceedings, however. In the opinion of the court, storage in a database of suspected cases does not constitute sufficient grounds for restricting fundamental freedoms. In 2007, Germany held not only the Presidency of the G8, but also the Presidency of the Council of the European Union. As Minister of the Interior, Wolfgang Schäuble wanted to expand the IgaSt database to encompass the entire European Union in the wake of the violent protests in Heiligendamm. The German Bundesrat also gave these plans its blessing at the time. It identified the Europol information system and the Schengen Information System as potential locations for the central “database on violent offenders who are active internationally”. Another option on the table was to network decentralised databases on violent offenders in the EU member states. Germany’s requests cropped up once again in a European Commission action plan three years later. An appreciable number of the member states – including Belgium, Lithuania, Poland, Sweden and Slovakia – saw no need at the time for a political data collection of this nature. Support was forthcoming from Bulgaria, Estonia and Latvia, however. For its part, the Federal Government gave preference to recording data relating to such individuals in the Schengen Information system – namely as “violent troublemakers”. However, a number of EU member states have yet to define troublemakers in their police law, a definition which would constitute the basis for police measures against those stored in the database. With this in mind, the German Ministry of the Interior suggested that these countries could help to collect this personal data, while enforcement measures would only be carried out where this is possible within the bounds of the law. Alongside travel bans, options available include imposing passport restrictions and reporting commitments on persons in question. None of the proposals for a European database on extremists has been realised to date. It must first be clarified whether the database is only to be used for investigative enquiries or also for police checks. Only then will it be possible to ascertain whether the database is managed centrally or whether networking national databases would be an alternative option worth considering. If the conditions for a search (e.g. an arrest warrant or extradition request) have been met, personal data may be stored in the central Schengen Information System. Moreover, police and intelligence services may, in accordance with Article 36, issue alerts for “discreet” surveillance or searches of persons stored in SIS II. The issuing agency then receives information regarding where and with whom the person was encountered. An “inquiry check” alert category, allowing individuals to be stopped and questioned, is also now in the pipeline. Alerts may now, in accordance with Article 36, be supplemented with a data category recording the type of criminal offence committed. A recent departure was the inclusion of the note “activity linked to terrorism”, for instance in the event that there is “concrete evidence” of preparations for a major violent offence endangering the state or connections with a criminal or terrorist association abroad have been established. Now would be an extremely inopportune moment for a renewed attempt to establish a central “troublemaker” database within the framework of the Schengen Information System. The reason for this is that the legal bases of the Schengen Information System are currently being revised while three new draft ordinances are awaiting adoption and implementation. It appears that this procedure must first be concluded before new alert options or categories of individuals may be taken into consideration. Until 2014, Europol operated the database Dolphin on non-religiously motivated terrorism as one of 24 Analysis Work Files (AWF). Only two AWFs now remain, Serious and Organised Crime and Counter Terrorism, which are divided up into the individual focuses as Focal Points, however. Dolphin has now been given the new name “Non-Islamist terrorism”. Individuals cannot be stored in this database without a link to terrorist activities, however. The boundaries between terrorism and extremism are blurred at Europol, however. Initially, the focus was on animal rights groups and “eco activism”. After Heiligendamm, Europol reported “left-wing and anarchist terrorism” at the 2007 G8 Summit. In its most recent annual report, the agency identified border camps and occupied houses as hotbeds of terrorist activities. Temporary “target groups” can be created in accordance with the new Europol concept. They are considered to be an “operational project” and are intended to support international investigations. A differentiation is made between a “criminal investigation” and a “criminal intelligence operation”. It would be conceivable for a target group of this nature to be set up for the G20 Summit, before being transformed into a Focal Point at a later stage. States home to those arrested at the G20 Summit, or those whose from whom the Federal Minister of the Interior has requested assistance for the identification of suspects, could take part in this initiative. Under the German Presidency of the Council of the European Union in 2007, the Prüm Convention, which had initially been concluded between a handful of countries, was enshrined within the European legal framework. The convention governs the exchange of police information as part of the investigations among participating states and also helps to simplify mutual queries of national DNA and fingerprint databases. The Prüm Convention or the corresponding EU Regulation are also intended to be used in order to speed up exchanges of information with regard to “travelling violent offenders”. Also at EU level is the European Criminal Records Information System (ECRIS), which functions according to a similar principle and in which convictions are stored. ECRIS is a decentralised system and the German central authority in the ECRIS network is the Federal Office of Justice. It will soon be possible for convictions of third-country nationals to be stored in ECRIS for the purpose of pursuing “foreign fighters”. This system will then be called ECRIS-TCN. Fingerprints are to be added to the mandatory data to be stored. The EU home affairs ministers have now agreed to store ECRIS data centrally at the EU level. A decentralised European Police Records Information System (EPRIS) is still a matter of debate. Here, the focus is not on information relating to convictions, but on investigative procedures. This proposal was included in the final version of the Stockholm Programme at the last minute in 2010 and has been repeatedly cited as a means for exchanging information on travelling violent offenders. EPRIS was conceived as “hit/no-hit procedure”. The countries involved in the system therefore do not have access to the data, but may enquire as to whether there is any information regarding specific individuals. If data is available, a further enquiry must be submitted stating grounds for why access to the data should be granted. Discussions on conceiving EPRIS as a centralised database are ongoing. While EPRIS’ implementation as such appears to be in no doubt, the way in which it will be implemented is an open question. The European Commission has now launched the project Automation of Data Exchange Processes (ADEP) as a technical feasibility study. In a similar manner to the Prüm process, an index can be consulted to ascertain whether there are police files on an individual in one or more member states. In the event of a hit, it would, in a second step, be necessary to request additional data relating to persons via the usual channels of police cooperation (such as the Prüm process). ADEP is being spearheaded by France. The Federal Criminal Police Office and Europol are also involved in the pilot project along with authorities from Finland, Ireland and Spain. National data collections on travelling violent offenders have also been exchanged bilaterally in the past. This was the case at the NATO Summit held in Strasbourg and Baden-Baden. Germany and France sent each other personal data that is to be deleted after a specific deadline has elapsed. A further pool for exchanging data on potential troublemakers is the Police Working Group on Terrorism (PWGT), which was established in 1979 as a response to armed left-wing groups in Europe. After these groups had been disbanded, PWGT accorded itself a new mandate to exchange and use information on “violent political extremism”. Among other things, the PWGT has focused on left-wing border camps. In connection with the No Border Camp protests in Brussels in 2010, the Belgian PWGT contact point sent its partner services in 16 European countries (the Federal Criminal Police Office in Germany) a list of names of 380 persons whose identity had been established during the course of the camp or who had been held in temporary custody. Among these persons were 88 German nationals, of whom a number were entered into the German INPOL database. The Federal Criminal Police Office reached a decision on the further storage of data at its own discretion.